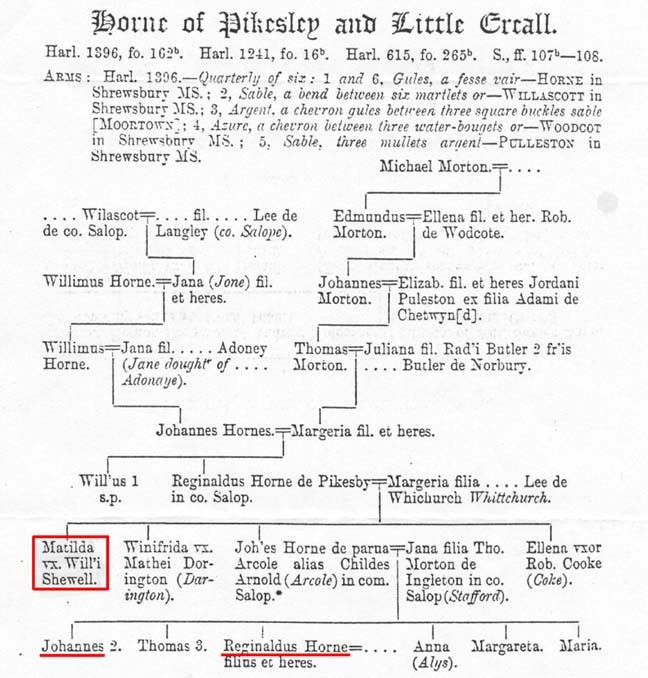 As shown above, Johannes (John) and Reginaldus (Reginald) were nephews of Matilda Horne who married William Shewell. Henry Sewall (1544 - 1628; m. Margaret Grazebrook 1575) mentioned in his will ". . . my loving kinsman Reginald Horne . . . my cosen John Horne . . .." At this time in history, the terms "kinsman" and "cosen" were used interchangeably, so both John and Reginald (underlined in red above) were cousins of Henry Sewall. Thus, Henry Sewall (1544 - 1628) was certainly a son of Matilda Horne and William Shewell. Note that various spellings of the Sewall name, including Shewell, Sæwall, Shæwell and even Showell, were used at this time. Click to return to William Shewell and Matilda Horne.